Love the feel and quality of fabric. It's not as nice as the pic makes it look but that is advertising for you. 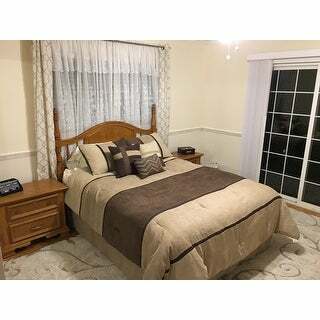 The comforter is super soft and very fluffy and the material is quality enough for a comforter set under *** . It's not the deep rich brown that I thought. It has almost a green hue. I included a pic of how it looks in my room. This comforter set is beautiful. Very rich and warm. The king is an average size king comforter at 92x104. My king bed is very large. The only drawback is I wish it was 96x110. Otherwise great price and looks awesome. I LOVE LOVE LOVE this comforter. Super soft and is the perfect weight - not too heavy and not too light. Works for cold and warm nights. Not lumpy at all and goes beautifully with my bedroom set. I bought another color set because I liked this so much. One thing to be weary of... I washed this in my washing machine at home. I have the Cal King size which is huge. The tag warns against washing in a tight fitting machine (recommends a commercial washer if not enough space) but I did it anyway and I ended up damaging the comforter. I will be buying a new one today but will take it to a commercial washer this time. Highly recommend this item. It's very beautiful and looks great on but Dad hates the fact it doesn't go to floor on king size bed. It covers mattress about 10-12 inches down on both sides. He wanted something to cover both mattress. A very nice looking set. Seems to be durable and comfortable. The comforter is very nice but does not cover both sides of the mattress as portrayed in the picture. I am very disappointed that I did not know this before spending the money. I would have found something else that covered both side of mattress. When I first opened this I was skeptical - the fabric looked flimsy (but the feel was soft), but when I put it on the bed I was so very happy with it - it is warm without being bulky, soft and cuddly... love the accent pillows (I have no use for the bed skirt as I have a trundle bed). Best of all, unlike so many other comforter sets, it is machine washable! I would love to get it in more colors! (are any available? Love it! Looking for a long time. Great price! 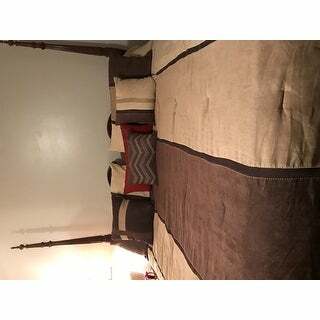 This comforter set looks exactly like it should ... it's got a nice weight to it, hangs in the bed very nicely, and the colors are as stated. It's a modern but plush look for my bedroom and the warm brown & beige tones go with everything. It's warm enough to use as a comforter and is even reversible to a solid chocolate brown. I highly recommend it for the workmanship too. Color was not vibrant . I want to return but no return stamp. 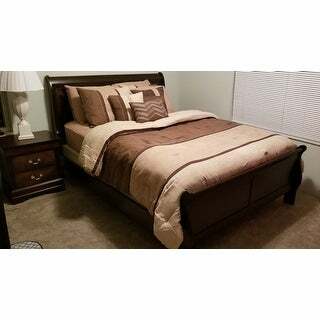 We love it, the brown makes are room look warm and comfortable! Love the style & pattern overall but not true California King size. I am in love with my new comforter. It is so pretty and just as pictured. I have gotten so many compliments on it and not only that but it is super comfortable. Arrived fast and just as expected. Nice but had to send back bc color didn't work with my new bedroom set, otherwise was nice a little pricey for the quality, wasn't as soft as I thought it would be more like microfiber. This is such a pretty comforter. It's a nice weight, not too heavy . It has an expensive look, but at a very affordable price. It lays nicely on the bed. Very soft. I would highly recommend. I’m not a big fan of polyester, however I knew before the purchase that that was what I would be getting. I am pleased with the purchase. It looks very nice. Care instructions: Machine wash cold,gentle cycle, and separately. Do not bleach. Tumble dry low, remove promptly,do not iron. If there is no free movement in the washer or dryer,use large capacity commercial washer/dryer. "Does this set not include pillow Shams?" "I love this set so much - does it come in any other colors?" I'm not sure about other colors but this set is beautiful! I have and love it! I like the look, I like Madison Park, and it's good deal! No! Sheets are not included!